Browsing the GFAA Gallery during its newest exhibit is like taking a walk on the wild side. Titled “Fins, Feathers and Fur,” the themed exhibit includes 72 paintings, photographs and other pieces by 41 members of the Gainesville Fine Arts Association showing two- and four-legged creatures — and fish — interacting with Mother Nature. 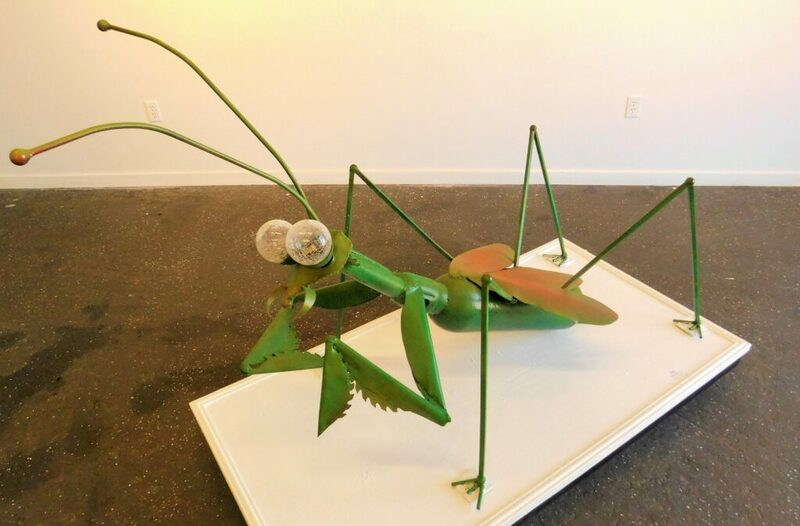 There’s even a metal sculpture of a 4-foot-long praying mantis! The public can get a first look at the exhibit on Friday from 6-9 p.m. during an opening reception at the gallery, 1314 S. Main St. The event is part of the monthly Artwalk Gainesville, which is taking place at more than 20 galleries and art-minded businesses in and around downtown Gainesville. “Michael brings such life to our gallery!” Kelman said. According to Kelman, the nonprofit GFAA boasts more than 300 member-artists. Next month, GFAA artists will display their works under the theme “Black and White, With a Twist.” Unlike previous years, this year’s theme allows artists to submit entries that include a burst of color in their otherwise black and white artwork. 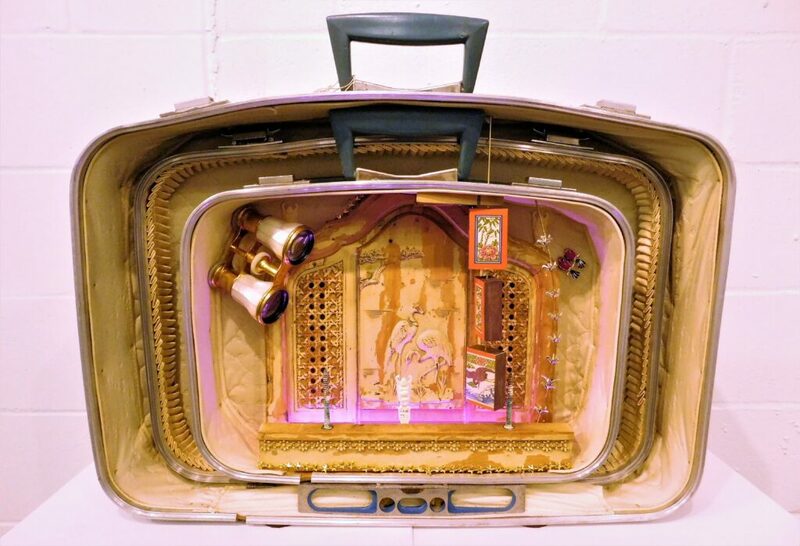 Gainesville artist Frank Curtis, known for his “suitcase art” created from vintage luggage, has a piece titled “Illumination” on display at the “Fins, Feathers and Fur” exhibit. The piece is actually three suitcases that fit inside each other, creating a stage-like presentation. 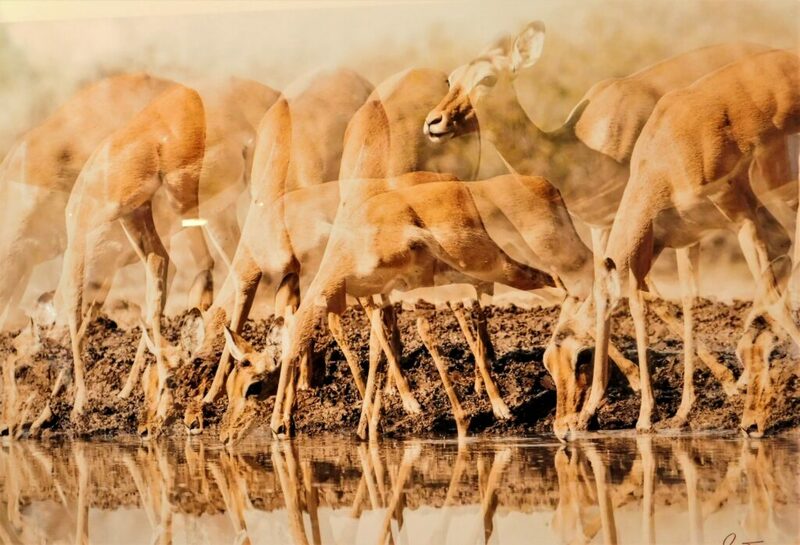 “At the Water Hole” (photography), by Vicki Santello, at GFAA Gallery. Most of the GFAA shows are juried. This month, Tina Mullen, director of UF Health Shands Arts in Medicine, judged the “Fins, Feathers and Fur” show. Awards will be announced during the Artwalk Gainesville, including a $125 Best of Show prize. 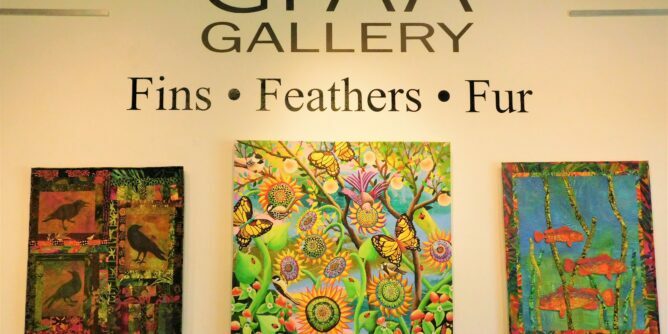 The “Fins, Feathers and Fur” exhibit continues through April 20 at the GFAA Gallery. The gallery is open Tuesday through Saturday 11 a.m.-6 p.m. Elsewhere during Artwalk, the Hippodrome Gallery is hosting an opening reception for “GIRLS (look at me),” a solo exhibition of new works by local artist and educator Marina Sachs. Working in her primary mediums, 35-millimeter photography and silkscreen, Sachs deals with femininity, commodification, repetition and endurance. The “GIRLS (look at me)” exhibit is a growing series of vibrant photographs that attempt to capture the image of women from the artists’ position as a female artist, thus escaping the male gaze in its creation. Sachs is pursuing her Masters of Arts in Art Education at UF. Her exhibit continues at the Hipp Gallery through April 21. There are several new venues for this month’s Artwalk. Curtis said the goal is to get everyone involved in the monthly event. First Magnitude Brewing Company (1220 SE Veitch St.): Hosting a variety of artists and live music by Alli W., as well as food trucks and craft beers. The gallery in the Source tap room is displaying Larry Finkel’s nature photography. Finkel has a passion for capturing wildlife pictures and has been known to stand in a local swamp for hours to capture that one great shot. Vendors in the Beer Garden will include Jenna Horner Art, Happy Williow Soaps, Java Holmes Brew, Jenna Brooke Niblack, Melody Tunks, Marissa Ogburn, One Healthy Planet, LLC (Rose Godfrey), Rock Paperstone, Natalie Walker with Solmana Collection, Danielle Jacobs and Brittany Donald Ragland. Note: Artwalk hours 6-9 p.m.
4Most Gallery (534 SW 4th Ave.): Presenting “lo que se fue y lo que se dejó” (“what was and what was left”), a solo exhibition by Ashley Ortiz-Diaz, MFA candidate in Printmaking at UF. Ortiz-Diaz makes space for contemplating death through word, image, installation and workshops. Throughout her thesis, the plane (including table tops, sheets of paper and those drawn) is utilized as a guide, translator, medium, platform for respite and a space for reflection. 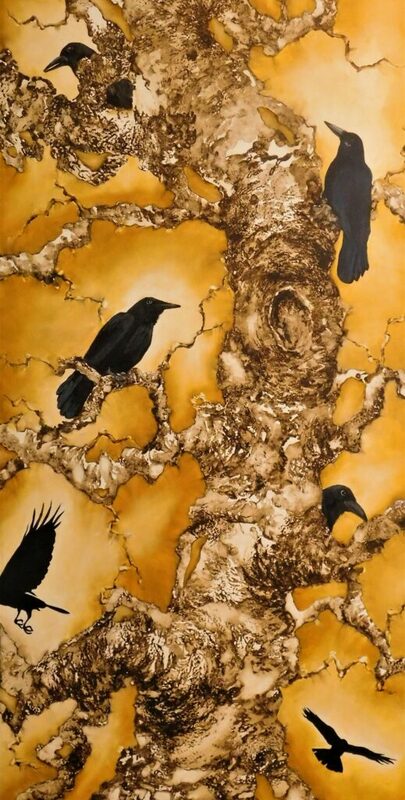 Somewhere Along the Way (201 SE 2nd Ave, Suite 110): Featuring work by dozens of local and regional artists in the atmosphere of a coffee and wine bar. Live music by Max Helgemo starting at 7 p.m.
Sweetwater Print Cooperative (117 S. Main St.): Presenting Molly Kempson’s “No New South,” an exhibit of linocut and letterpress prints that addresses the duality of loving the American South while confronting painful histories. The exhibition continues through April 24. After Artwalk, the gallery is open on Thursday afternoons and Friday mornings, or by appointment by calling Stewart Thomas at 352.514.3838. Lennie Kesl Studios at the Tench (115 S. Main St.): Presenting “Animals in Our Lives” by local artists Milena Cosenza and Samantha Kelly of F.A.C.T. (Fighting Animal Cruelty Together), portraying the many ways in which we view and treat animals. The Bull (18 SW 1st St.): Presenting “About Face too,” drawn portraits by Josh Wilson. These portraits explore the beauty and expressed emotion of the human face, defined by the line. Wilson has been offering his unique take on Gainesville and its people for more than a decade. The Front Porch Backsteppers (bluegrass) perform at 9 p.m. The SL8 (10 E. University Ave.): Presenting “A Salute to Women’s History Month.” Gainesville artists Nava Ottenberg and Nathan Grimes, as well as select works by other local and out-of-town and out-in-the-Cosmosphere artists, including Scott Wood (Clermont), Virginia Zuelsdorf (Orlando), Jiri Lonsky (Czech Republic) and Jade DiMarco (New York City) as well as Gainesville’sGrace Lamerson, John Korb, Lennie Kesl, Lucas Thon, Cory Collins, Josiah Lloyd, Pateh, Michael Levy, Charlie McWhorter and Salvador Dali (Spain). Florida Community Design Center (101 N. Main St.): Hosting the show “Doodling: Entryway to the Joys of Doing Art!” Through a series of drawings and paragraphs, contributors will demonstrate how they have progressed in their doodling and drawing, and how it has helped them in life. Education and hands-on activities for visitors included. Cypress and Grove Brewing Co. (1001 NW 4th St.): Presenting the show “Little Urchin” by Gainesville’s Jorge Ibanez, former teacher at Santa Fe College. Expressive and fun works for your enjoyment. There will also be live music and fresh brews. Uniquities Consignment Shop (526 N. Main St. with parking in back): For our first Artwalk Gainesville, we are proud to present artist Thackary Cooper. His travel photographs capture the beauty of nature and those moments that leave us in awe. For more information, contact Betty Freddes at 352.672.6001. The Collaborative Shoppe (532 N. Main St. with parking in back): Taylor Grosse developed her artistic style as a meditation and outlet for relieving stress. She creates unique, intricate designs through the use of line, shape and pattern. Grosse will have a creativity station — $3 per person for a coloring card (3.5 inches by 4.5 inches) designed by Taylor to color. Colored pencils will be provided. The shop offers a wide selection of art, gifts, lifestyle products and clothing from local artisans, handmade businesses and Fair Trade. The facility serves as a DIY classroom for workshops taught by locals for all ages and as an entertainment venue for artisan markets and events for friends & family. MindSpace Collective (834 E. University Ave.): Introducing its latest gallery collaboration, “Goddess Rising,” bringing together the talents of three local artists: Iris Coe-Gross, Kali Levitov and Larissa Kulyk. Goddess Rising is their inspirational work to local artists that draws on the feminine spirit, family, empowerment and spirituality.